On Jan. 22, 2013, debris from a Chinese anti-satellite program test hit a Russian satellite. A small Russian spacecraft in orbit appears to have been struck by Chinese space junk from a 2007 anti-satellite test, likely damaging the Russian craft, possibly severely, SPACE.com has learned. The space collision appears to have occurred on Jan. 22, when a chunk of China's Fengyun 1C satellite, which was intentionally destroyed by that country in a 2007 anti-satellite demonstration, struck the Russian spacecraft, according to an analysis by the Center for Space Standards & Innovation (CSSI) in Colorado Springs, Colorado. CSSI technical program manager T.S. Kelso reported that the collision involved the Chinese space junk and Russia's small Ball Lens In The Space (BLITS) retroreflector satellite, a 17-pound (7.5 kilograms). The Fengyun 1C satellite debris was created during China's anti-satellite test on Jan. 11, 2007, and has posed a threat to satellites and crewed spacecraft ever since. It is not immediately clear whether the satellite is merely wounded or completely incapacitated. The space collision is the second substantial in-space accident between an active spacecraft and a defunct satellite or piece of space debris. In February 2009, a U.S. communications satellite was destroyed when it was hit by a defunct Russian military satellite, creating a vast debris cloud in orbit. and Russia's small Ball Lens In The Space (BLITS) retroreflector satellite is a 17-pound (7.5 kilograms) built for satellite laser ranging experiments. It launched in 2009 and was expected to last five years in space before it was struck by Chinese space junk on Jan. 22, 2013. The BLITS satellite is a nanosatellite consisting of two outer hemispheres made of a low-refraction-index glass, and an inner ball lens made of a high-refraction-index glass. It was launched in 2009 as a secondary payload on a Russian rocket and tracked by the International Laser Ranging Service for precision satellite laser-ranging experiments. Satellite laser ranging use short-pulse lasers and state-of-the-art optical receivers and timing electronics to measure the two-way time of flight (and hence distance) from ground stations to retroreflector arrays on Earth orbiting satellites. On Feb. 28, the International Laser Ranging Service confirmed that the BLITS nanosatellite had collided with a piece of space debris. "As a result, an abrupt change occurred of the BLITS orbit parameters (a decrease of the orbiting period)," ILRS officials explained. Besides this, as could be seen from an SLR station photometrical observation results, the BLITS spin period had changed from 5.6 sec before collision to 2.1 sec after collision. The ILRS Central Bureau is based at NASA's Goddard Space Flight Center in Greenbelt, Md. 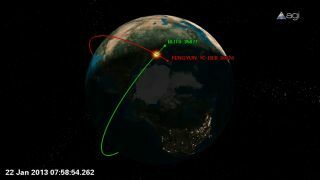 The analysis by Russian scientists found that the orbital change on the BLITS satellite occurred on Jan. 22 at 2:57 a.m. EST (0757 GMT). "They requested help in determining whether these changes might have been the result of a collision with another object in orbit," the CSSI's Kelso explained in a blog post. In 2007, China destroyed one of its own – an aging Fengyun-1C weather satellite – via an anti-satellite test. Starting from the hypothesis that an object capable of causing this change in the orbit of BLITS might be large enough to be tracked by the U.S. Space Surveillance Network, CSSI reviewed its own Satellite Orbital Conjunction Reports Assessing Threatening Encounters in Space, which is an archived database of potential space debris threats. That review discovered only one close approach with another object, although it was supposed to be far apart, occurred for the BLITS satellite on Jan. 22. "Although the predicted distance would seem to preclude a collision, the fact that the close approach occurred within 10 seconds of the estimated change in orbit made it appear likely that this piece of Fengyun 1C debris actually collided with BLITS," Kelso wrote. The CSSI is continuing to work with Yurasov and Nazarenko to further assess the circumstances of this likely collision. Kelso told SPACE.com that he is trying to address technical questions on this event, such as whether the individual masses of the pieces can be determined to assess how big of a piece might have come off of BLITS satellite. Kelso said that the U.S. military’s Joint Space Operations Center released on March 3 the first two-line element set (TLE) — a data format used to convey sets of orbital elements that describe the orbits of Earth-orbiting satellites — for debris associated with BLITS. That information further confirms CSSI’s analysis, Kelso said. The threat of space debris to satellites and crewed spacecraft orbiting Earth has been a growing problem. There are thought to be about 600,000 objects larger than 1 cm (0.39 inches) in diameter orbiting Earth, and at least 16,000 larger than 10 cm (3.9 inches), space debris trackers have said. Leonard David has been reporting on the space industry for more than five decades. He is former director of research for the National Commission on Space and a past editor-in-chief of the National Space Society's Ad Astra and Space World magazines. He has written for SPACE.com since 1999.Follow us @Spacedotcom, Facebook and Google+. Original article on SPACE.com.